As you know from using your rice cooker, it does more than cook rice. You’ve probably used it to make cooked cereals, soup, chili, veggies, and pasta. If you’ve forgotten to clean the rice cooker for a few weeks, the food inside can also grow mold. 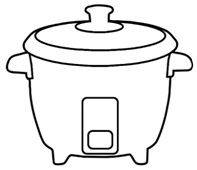 To keep your rice cooker in tip-top shape, it must be cleaned after each use. With no effort at all, it can always be clean and ready for your next meal. It’s a straightforward process and the cleaning depends on your brand and model. 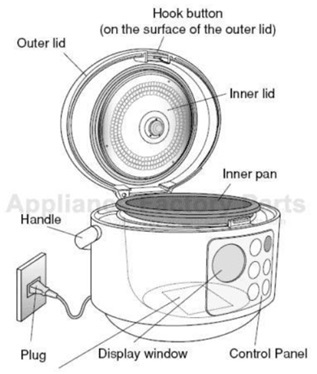 Features of your rice cooker can impact the procedures such as the unit having a non-stick coated inside cooking bowl and parts that can be removed for easier cleaning. Always read the instructions that came with your cooker. If you don’t have it, you can find manuals online using the model number on the bottom or side of your unit. Different brands and models of rice cookers have different instructions for cleaning and maintenance. Most of today’s rice cookers have some parts that go into the dishwasher. But if not, try these methods. Step 1. Wait until the rice cooker cools to the touch and unplug it from the wall and the cooker, unless it is hard wired to the unit. Be sure all the old food is out of the interior pot. Never submerge the pot with plug electronics into water; it will be ruined forever. Step 2. Take out the inner pot and soak in hot dishwashing detergent overnight or until you think the food particles are off. Rinse until no soap remains and dry with a dishtowel not paper towels that break off and stick to parts. Soak the spatula, cups, lid inserts, and anything that comes loose from the cooker, such as the steamer tray, condensation collector, ladle, measuring cup, including the oil catching cup, if you have one with your cooker. Be sure to clean the lid gasket too. Clean the heating element when completely cooled. Do not use spray cleaners. See the illustration for the parts below. Step 3. Wipe the inside of the cooker with a soapy sponge or dish cloth. Wipe the control panel and knobs. Do not use abrasives such as scouring powder, steel wool pads, brushes, or the abrasive plastic on the back side of some sponges. Do not scrape with sharp knives or metal that will leave scratches. Do the same for a lid that does not detach. Rinse and towel dry. Do not use vinegar in the inner cook pot and be careful washing if you have a Teflon® or a non-stick coating; it can peel off. A good cleaning paste also works well. You can always use a baking soda and water paste to clean with too. Use a wet sponge or cloth and wipe the outside and inside down for a hygienically fresh cooker in no time. Do not get water into the electrical part for where the plug goes in. Water ruins electrical components forever. Step 4. Let all parts and the rice cooker air dry for a few hours too before putting it away. Tip: Clean the rice cooker after each time it’s used; don’t wait until it’s a hard stuck-on mess.When you’re finished cooking, you will frequently see burned or hard grains of rice stuck on it. You can remove those if they are hard to get loose with a wet sponge or cloth or use a wooden spoon or chop stick to gently remove it right away. I sometimes use my flat plastic letter opener inside a face wash cloth to remove food stuck under handles and other tight parts outside. Note: The ceramic, stoneware, and lid will not endure abrupt changes in temperature. Therefore, do not fill a hot pot with cold water; it can crack. Ceramic and stoneware are porous materials and when submerged in water over the top, water can enter the material. I did that to one of my baking dishes and it looks horrible now. The bowl can be filled with water and sit but not submerged in water. Are Ceramic Pots and Pans Safe to Use?